A couple months I Rebooted Providence Station. Shortly after that, Portland, Oregon based architect Jonathan Winslow forwarded me the plan he did for the station area while he was a student at RISD. On his website you can see that Jonathan’s plan is a complete re-imagining of the existing train station. The new station features an atrium allowing light to reach down to the railroad platforms, an attached hotel, expanded restaurant and retail space, visitor information, new ticket booths, expaned waiting areas, and more. Outside the station, where Station Park is now, Jonathan proposes a promenade connecting the station to the mall, a perpendicular promenade connecting the State House and Waterplace, a dining building, open space with a water feature, and more office buildings completing the streetwall on Francis Street. 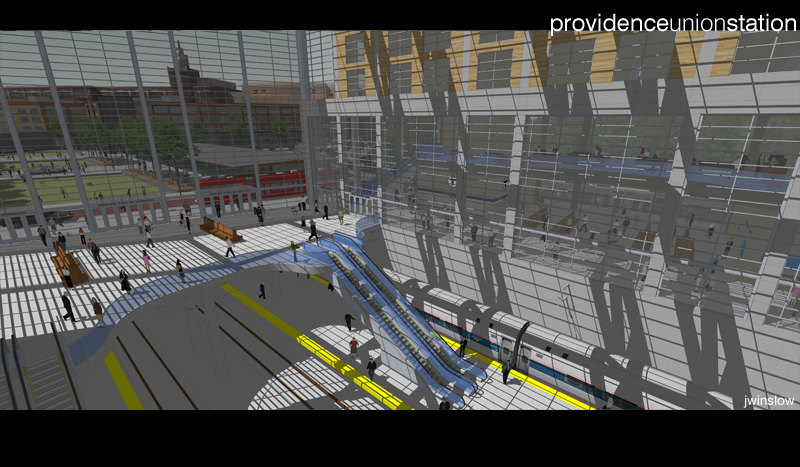 A streetcar loop would connect the new station to Providence Place and Kennedy Plaza. Jonathan has further explanations about his designs and many many more cool renderings on his website. You need to check it out. It’s quite an ambitious plan and I like the overall idea. That said, the actual station building is hideous. It would be an atrocity to have that hulking glass box so close to our beautiful state house – GTech is already close enough. I love this. However, is it even possible to build on Station park? It would be technically possible to build over the Amtrak tunnels but unlikely for two reasons (at least in the near term), Amtrak’s recalcitrance, and the abundance of available land throughout the city. In city’s like New York and Boston that are built out, air-rights developments are feasible, we are not at that point in Providence. There is quite a bit of land at Station park that is not over the rail tunnel, and Jonathan’s plan could be altered for that. The green Promenade would still extend to the mall, it would just reach the mall at the intersection of Finance Way, rather than mid-block. Jonathan Winslow’s effort is heroic. A great deal of thought has gone into this project and on many levels. This is the kind of planning/urban design is what the city and state should be engaged in. It’s too easy and premature to criticize specifics about architecture with this overall strategy. What would actually be built, if this proposal were adopted would look very different by the time construction were to begin. Having said that a positive aspect of the station design is the experience from within, which has inspiration from the original New York Penn Station. The main station space would be breathtaking. The building envelope could be modified for those who find it offensive, but the basic concept is powerful. From an urban design standpoint, I question the two Francis Street buildings. They’re too timid and flimsy in their bulk. They don’t hold up to the giant volume of the mall and don’t offer a strong counterpoint to the station/hotel building. One possible option could be to design them with multiple heights to respond to varying neighboring buildings. The light-rail line is an interesting approach, which differs from earlier discussions on this topic. What Jonathan is proposing would begin to reintegrate the metropolitan region by rail, which as has been discussed so many times before been dominated by car culture for the last 60 years. A future extension of the light-rail could reach to New Bedford and the Cape. For the train station commuter and regional trains, I suggest adding a third platform and a sixth track. If only a fraction of this proposal were to be built Providence would greatly benefit. A newly designed station, such as this one, could become icon on a grand international scale. Powerful idea here. I agree with Mr Brassard that the frontage with Providence Place should step up torwards The GTech.Mr Winslow has truly given a whole lot of thought&energy to this project.Wouldn’t be something if most of these renderings were realized to the letter.It helps too that the architect is surrounnded by the city of Portland while he works.That can only inspire the man. After a thought mining night of considering the hopes and dreams of urbanists worldwide,I culled projects realized throughout history.This transportation gate to Providence makes a whole lotta’ scense. First;Providence has always fielded grand structures to make the population contemplate,consider Teft’s Union Station of 1845.The nation’s largest train station at the time(vision19th century style)Providence was perhaps the 14th or 15th most populous municipality at the time. Back through the city’s history,urbanists have always stepped up giving the city first rate reservoirs,gas light systems etc. That leading edge excitement,as we see,has not gone dorment. Today a youngProvidence educated urbanist like Teft has shown his Vision.Anything short of this excitement should not be tolerated. Thank you for the responses, I really appreciate the feedback and critique. My plan was to do a rather simple, muted, symmetrical building exterior for the station/hotel to make up for the bulk of the building so that it helps minimize its visual impact on the Statehouse. Although at the same time I do feel a central train station IS a major civic building and deserves some significance. Since the hotel atop the station was going to provide some mass to the station building anyway, I felt the mass would be the way to portray this building’s significance and then play down the exterior. The station building mass and height is really about on par with the Providence Place Mall and Renaissance hotel, both of which are directly across the street from the Statehouse lawn and perhaps even closer to the Statehouse than this station, so I don’t think proposing this mass here is too out-there. And of course there are the much taller WaterPlace towers only a little further back. I do certainly respect and am happy to hear of the concerns over aesthetics, mass and height with building in such close proximity to the Statehouse. These concerns are certainly very valid and important given the architectural significance of the Statehouse as masterpiece building and the civic importance of the Statehouse as a place of governance and representative of the people of the state of RI. I really wanted to create a gateway to the city with sense of arrival and a station that communicated that Providence was an important city, both of which I find lacking in the current station. I very much agree about the two Francis Street buildings. They were designed as background buildings with little design attention and were really just simple blank masses extruded from a footprint. It was through rendering this site, that I had to give them some basic aesthetics. They should definitely be taller and more articulated in form. The design focus was almost entirely on the train station building and the site plan for Station Park. I should add that I called it Providence Union Station despite the fact that Providence already has/had a station with that name because it is the term for a grand gateway busy train station and that is what I was hoping to create/bring back to Providence (plus the old Providence Union Station is no longer a train station). I hope this can add to the dialogue and help stir ideas for what this under-performing yet important site could be. I wish everyone in RI the best and a safe uneventful outcome from Hurricane Irene. Personally, I don’t get twisted about building near the State House. I think creating dramatic view corridors from Francis Street and Exchange Street more than make up for any concerns about too much height too close to the State House. As for the station name, there was a group working on a bus depot for the area which they called Gaspee Station. Providence Gaspee Station is a nice name.